Rescatux 0.32 beta 1 has been released. Rescatux 0.32b1 size is about 406 Megabytes. 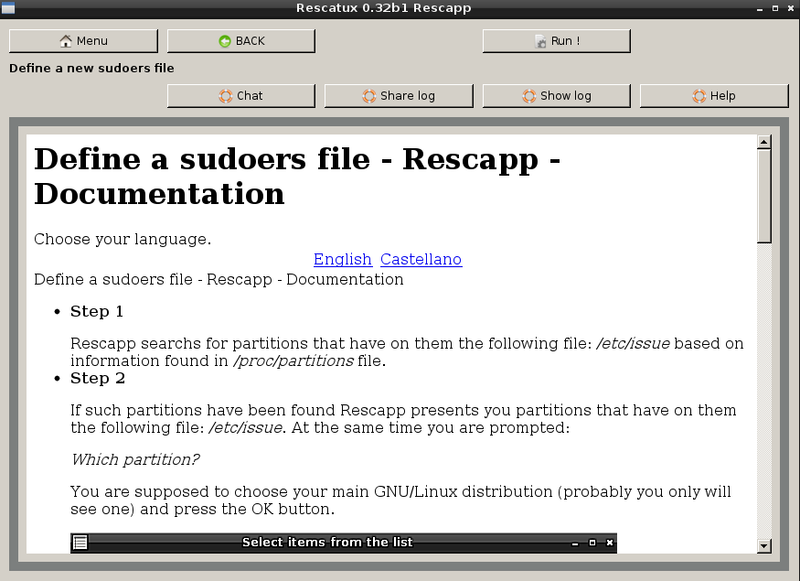 Rescatux 0.32 beta 1 Regenerate Sudoers file. Note the support buttons rearrangement so that Run button is visible. 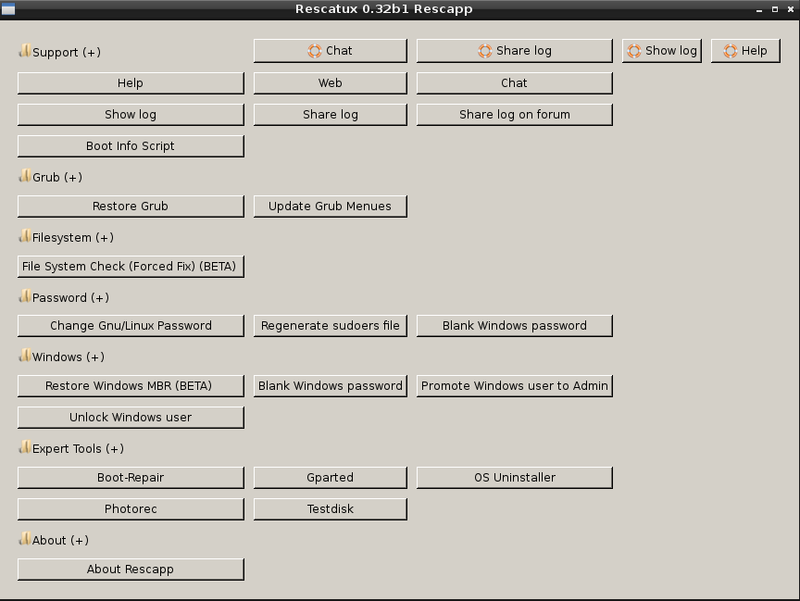 Trendynick, from the irc, sent me a nice mockup of how he thought Rescapp should be designed. The final result is 100% as he expected but most of it. Now we can add new options without bothering about design because we have got an scroll bar for seeing all the options. The best thing about the new design is that you can see all the available options in one glance. That makes easier for new comers to discover the truly Rescatux potential. It also makes easier to run options because the Run option screen which shows the html help, as always, has had some of its buttons rearranged. 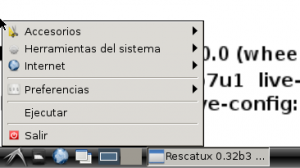 As I was not able to use RazorQT from unstable or testing Debian, and as LXQT was even more difficult I had to drop RazorQT and fallback to LXDE (which it’s currently based on GTK2). The long waited dream of an almost QT based rescue cd has been paused. That’s the reason why I had to change 0.31 to 0.32. The other reason for 0.31 to 0.32 change is because I am dropping Super Grub2 Disk integration. I have been thinking about a Rescatux Plus edition that would include it but I’m not very sure of it. I would rather prefer to have only one Rescatux download and then, if you want to, you can build your USB with both Super Grub2 Disk and Rescatux in it. If you wanted an ISO for the your CDROM with both Super Grub2 Disk and Rescatux, well, you will have to burn two cds. If you don’t agree with this decision please comment below so that we can gather actual feedback on how many people think the Super Grub2 Disk is something useful for them or not. As you can see one drawback from using isolinux instead Grub2 from Super Grub2 Disk is that the logo and boot entries are the Live ones (Rescatux is based on Debian Live project) instead of Rescatux ones. As this is a beta and I don’t want to mess in a long time with Rescatux code I have decided not to worry about that. Unless you think you are going to have problems with network connections (which it’s not actually needed for Rescatux to work, only for asking for support) if you have Rescatux 0.31 beta 5 there’s no need for you to download this version. Of course, you are welcome to download it so that you can give us feedback so that we can improve it. Select keyboard from Grub2 boot or Isolinux boot so that you can type your correct password when resetting Gnu/Linux password. (Or type password without masking it). Packages versions for this release can be found at Rescatux 0.32b1 packages. It’s based on Debian Wheezy (Stable). Rescatux 0.31 beta 3 has been released. Added a frame so that embedded webpage is seen inside a grey square. Now xchat nickname shows Rescapp version so that accurate help can be given in the chat. Rescatux 0.31b3 size is about 424 Megabytes. Packages versions for this release can be found at Rescatux 0.31b3 packages. It’s based on Debian Wheezy (Stable) and not Debian (Testing). I’ve added these expert tools because, basically, I don’t have to implement boot-repair functionality into Rescapp wizard (And the idea is one or two years old :(). Another reason might be because testdisk, photorec and extundelete can be useful in some situations but… again… I would rather include its functionality into Rescapp script (instead of adding disconnected apps). Not everything is bad because adding these tools has made me add the Expert tools options menu to Rescapp. Now you can find Gparted inside of Rescapp instead of having to search for it in the Start menu. I’m not sure if I want to freeze 0.31 beta 3 as it is right now or if I’m going to add one of these things: 1. Add more chntpw-ng functionality to rescapp. 2. Improve the Restore Grub and Update Grub to be able to detect Logical Volumes (LVM). 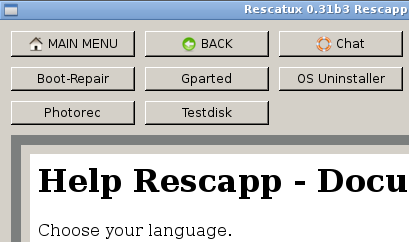 Rescatux 0.31 beta 1 has been released. Gpart package was added so that Gparted attempt data rescue option works ok. It can also be used by expert users. Rescatux 0.31b1 size is about 396 Megabytes. Distribution origin is Spanish and not French. Packages versions for this release can be found at Rescatux 0.31b1 packages. Now it’s based on Debian (Testing) and not Debian (Stable). Rescatux 0.31 stable will probably be based on Debian (Stable) as Wheezy will be stable itself. You probably need to update your script to reflect that default kernel is vmlinuz1 instead of old vmlinuz. I’ve tried myself the distro in my dev environment all the current options and they seem to work ok. Please test the ISO and report back if something that worked on previous stable versions no longer works in this beta version. Rescatux 0.30 Release Candidate 1 has been released. Beta options are described as (BETA). Syslinux version has AMD64 boot as the default one. So, aproximately in a month time if there is not any special problem I’ll release 0.30 stable at last with a big post aimed at internet press which only copy and paste so that they explain accurately what Rescatux is, what it’s not, and what SGD and SG2D are. Bugs and Feature requests they are found in Forja Cenatic. Thank you Cenatic! Whenever I release a new beta the idea is to copy and paste this roadmap and to replace the dots (..) with the beta version where the feature has been implemented. An example would be: (0.30b3). Rescatux 0.30 beta 7 has been released. 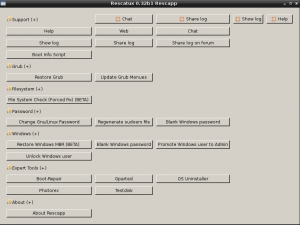 Rescatux 0.30 beta 6 has been released. Ctrl+Q makes Rescapp to exit.